A child was born in 1954 in British Columbia and surrendered for adoption. Fast forward 42 years, and the British Columbia government passed an act to open the original birth certificates to adult adoptees. That child — now an adult — obtained her original birth certificate and found that the birth mother’s name was shown as — using only the initials here — O.M. No birth father was shown. The hitch: by 1996, O.M. had passed away and the adoptee — let’s call her W.P. — wasn’t able to find any relatives who had any information about the adoption. Fast forward another 22 years to the age of the DNA test, and W.P. tests with AncestryDNA then uploads her data to other databases. But there’s a hitch: two people are in the AncestryDNA database with family trees that show they are the children of O.M.’s brother. And neither of them shares any DNA with W.P. It means, in a nutshell, that W.P. has more DNA testing to do. Because these DNA results by themselves can’t answer the question of whether W.P. is the child of O.M. This is yet another case where we need to go back to one basic principle: DNA alone can never be enough to prove a genealogical relationship. In every single solitary case, bar none, without fail, we are going to need at least one more piece of information to be able to prove a genealogical relationship. I’ve said this before,2 but it bears repeating. What seems, on the surface, to be compelling DNA evidence is in fact compelling DNA evidence — but it’s compelling if and only if it’s properly interpreted. 1. The paper-trail cousins haven’t opted into the matching system at AncestryDNA. 2. W.P. isn’t O.M.’s child. 3. The father of the paper-trail cousins isn’t O.M.’s brother. And any of these could be true at this point. First off, the fact that someone has tested at AncestryDNA and has a tree online at Ancestry doesn’t mean that person has opted to be shown as a match to others.3 Each person who tests has to choose whether or not to be shown as a DNA match, and there’s nothing in the system to tell W.P. whether she isn’t showing as a match because she doesn’t match or because those paper-trail cousins have opted out. Until W.P. knows whether those paper-trail cousins are in the matching system, she can’t draw any conclusions about their biological relationship at all. That’s one example of that one additional piece of information needed in this case. But there are more. If those paper-trail cousins have opted in, and are showing as matches to others but not to W.P., then W.P. can go on to the undeniable fact that first cousins inevitably show up as matches in genealogical DNA tests. While it’s true that the odds of a match are rarely if ever given as 100%, it’s also true that none of us in the genetic genealogy community are aware of a single case where first cousins haven’t shared enough DNA in common to show up as matches to each other. So, while nobody wants to speak in terms of absolutes, in reality the only explanation for W.P. not showing up as a match to those particular paper-trail cousins if they’re all in the matching system is that she and the paper-trail cousins aren’t first cousins at all. But that fact doesn’t tell her anything more than that: it doesn’t tell her why they’re not first cousins — which of the other scenarios is most likely. Of course, it’s possible that the woman who gave birth to W.P. used a false name when she said she was O.M. It’s not uncommon for an adoptee to discover that the mother shown on an original birth certificate used an alias or “borrowed” someone else’s identity. It’s at least as common for any father’s name shown on such a certificate to have been made up out of whole cloth. But it’s also possible that the father of the paper-trail cousins wasn’t really O.M.’s brother at all. Those cousins may themselves be adoptees, in which case of course they wouldn’t match W.P. Or, if O.M. and her brother were paternal half-siblings (not sharing a mother), then a misidentification of O.M.’s father or the father of the cousins’ father would also explain why they don’t match. In other words, W.P. just doesn’t have enough information right now to draw any conclusions at all. Every explanation has to stay on the table until W.P. gets that one more piece of information necessary to properly interpret the results. No matter what the reason for the mismatch is, more testing can give her some answers. 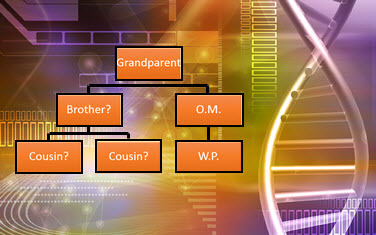 If the paper-trail cousins aren’t in the matching system, for example, then testing other members of O.M.’s family can help W.P. determine whether she really is O.M.’s child. If they are in the matching system, then comparing their matches to her matches can help them separate out which of them is more likely to be in the M. family at all. And in any case working with her closest matches and perhaps testing more of their cousins can help her narrow down where she fits into the families of those matches. It’s a tough case, for sure. But it’s a great case for hammering home the point: DNA alone can never be enough to prove a genealogical relationship. In every single solitary case, bar none, without fail, we are going to need at least one more piece of information to be able to prove a genealogical relationship. Without that one more piece of information, we’re left with that tangled web where somebody deceived somebody… and we don’t know who.